My mother loves to feed people and I was stunned to see during this visit that almost every visitor, expected or unexpected was welcomed with the same enthusiasm and love that has been the norm since my childhood. I was thrilled to see that despite drastic changes in our society, this aspect had remained the same in my parents home. And I have to tell you that my mother particularly loves to feed dosas to her family and friends. Anybody who has had her dosas loves them. And the latest one to join the coterie is the apple of her eye, her three year old grandson who ate dosa every other day during his holidays at her place. My mother’s dosas are a cross between Davangere benne dosa (butter dosas from a a town in the Indian state of karnataka) and the masala dosa. She makes it thin and crisp or soft and fluffy, laden with butter for the added richness or without any fat, filled with chutney and the spiced potatoes on the inside or served on the side as per one’s liking. 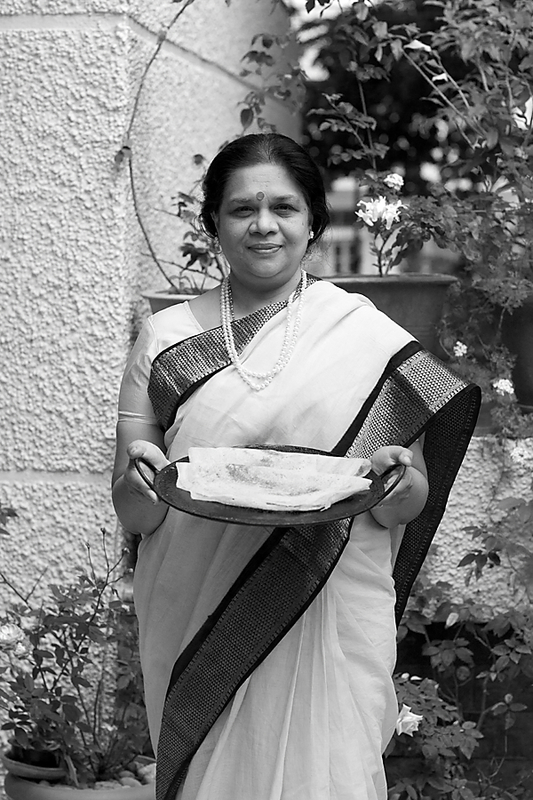 She serves her dosas with a wide array of chutneys and this time it was a simply delicious coconut sesame chutney. Whatever the technique that goes into making the personalized version, the spiced potatoes encased with the crisp on the outside and fluffy on the inside dosa interspersed with creamy coconut chutney in every bite is the ultimate delight to my senses. 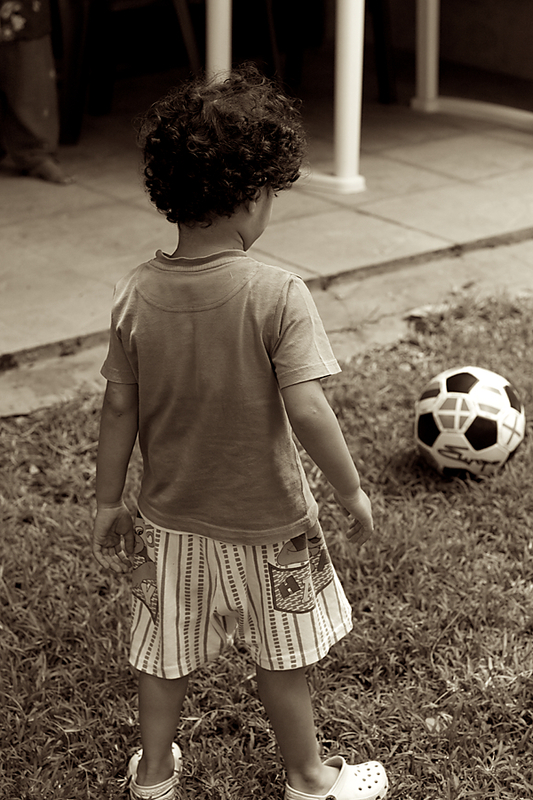 It is also the taste of childhood that I find comfort in and go back to, again and again! At times, I like to eat this dosa without the potatoes, with just the chutney. Some times I might like to add some butter or ghee. But when I want to savour it in complete I make sure there is the potato as well as the chutney. One thing I strongly believe in is in using a cast iron griddle for cooking dosas or for that matter anything that has to be cooked on a griddle or a flat pan (think pancakes, rotis, chapatis, parathas and the like). Infact, there is no room for non stick cookware in my kitchen. Cast iron if seasoned well and used properly becomes naturally non stick and provides taste, texture and has some added health benefits. 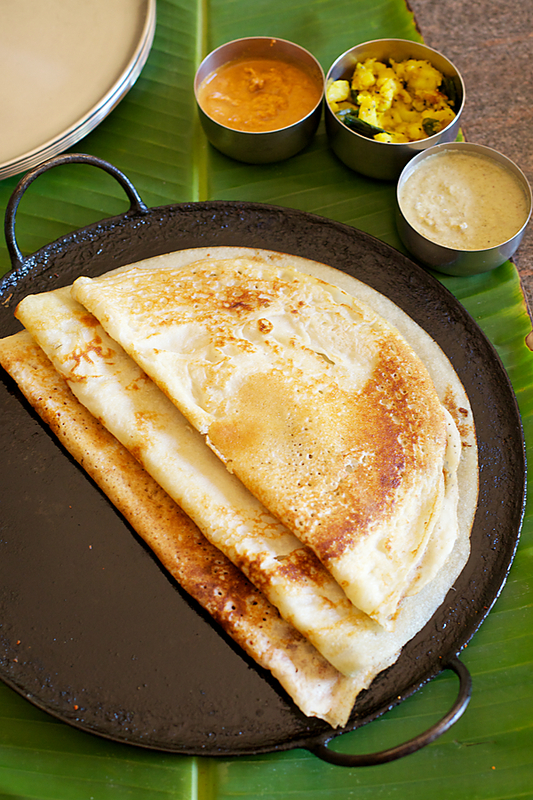 Dosas have been cooked in South India in cast iron griddles for hundreds of years and dosas cooked in them have a special character to them too. you can make teeny weeny ones and serve them as starters, make them for breakfast, serve them at lunch or dinner with the added accompaniments or even as an evening snack! They are so versatile and are great for kids too. 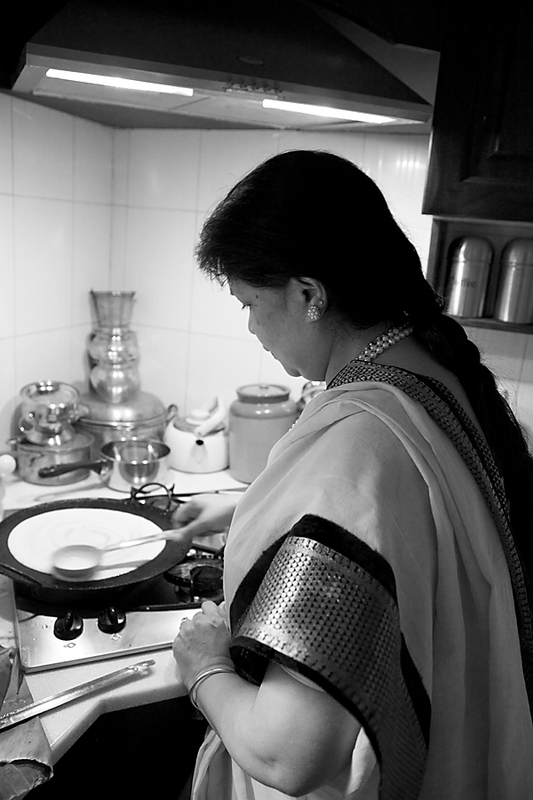 Having some dosa batter in the refrigerator has saved many mothers from the drudgery of slaving in the kitchen for long at times when one is not in a mood for it. Practically, every South Indian mother has her own version of the dosa and I’m glad to be sharing my mother’s version here. The dosa with its magical prowess on the tate buds, providing immense taste, texture and contentment has made many drab days better and if it is not already a part, I hope it works its magic into your life too. P.S.- If you want to know more about my cooking and food beliefs, read my interview here. 440 gm (2 cups + 2 tbsp) raw rice (use any short grain rice like sona masuri) 70 gm (1/3 cup) channa dal (bengal gram dal) 70 gm (1/3 cup) yellow moong dal (green gram dal) 70 gm (1/3 cup) toor dal (red gram dal) 140 gm (3/4 cup) urad dal (split and husked black gram dal) 6 tbsp poha or flattened rice flakes 2 tsp methi (fenugreek seeds) 3 tsp salt water In a bowl assemble therice, dals and the fenugreek seeds. In another bowl put in the urad dal. Wash them separately in many changes of water, cover with water and allow to soak for 4 to 6 hours. Wash the poha and allow to soak in the water for about an hour. Drain the water from the rice, dals, fenugreek seeds and the poha and using a little water grind the rice, dals, fenugreek seeds and poha together until you get a smooth paste. You might want to do this in batches to make the process easier. Repeat the same for the urad dal. Drain and grind into a smooth paste using a little water. In a large vessel or a bowl (keep in mind that the dough doubles or even trebles in volume depending on the temperature) put in both the ground batters and salt and mix well with your hands until there are no lumps. Using your hands gives the batter the required warmth for the process of fermentation to begin. Use a little more water if required if the batter is stiff. The batter should look, soft, smooth and somewhat like a cake batter. Cover and keep aside to ferment for about 12 to 15 hours. Notes:1.Use a cast iron griddle for taste, health and proper texture. 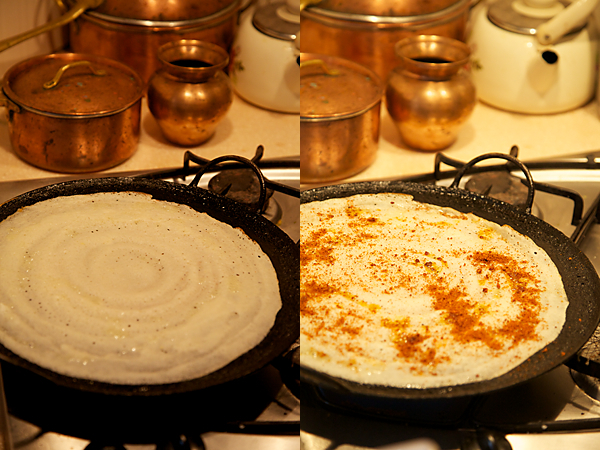 The colour of the dosa depends on the variety or quality of the rice and the dals used. We normally use sona masoori rice for making the batter but you can also use any other short grained raw rice. In a blender or a food processor, put in all the ingredients for the chutney and blend into a smooth paste until well blended. Amazing post. Gonna try it today. I need a tip . Anything to make the dosa crispier? Like adding a lil bakin soda? My mom usually does that if we ave guests. Do u think it will work. Divya: I never add soda in dosa batter. 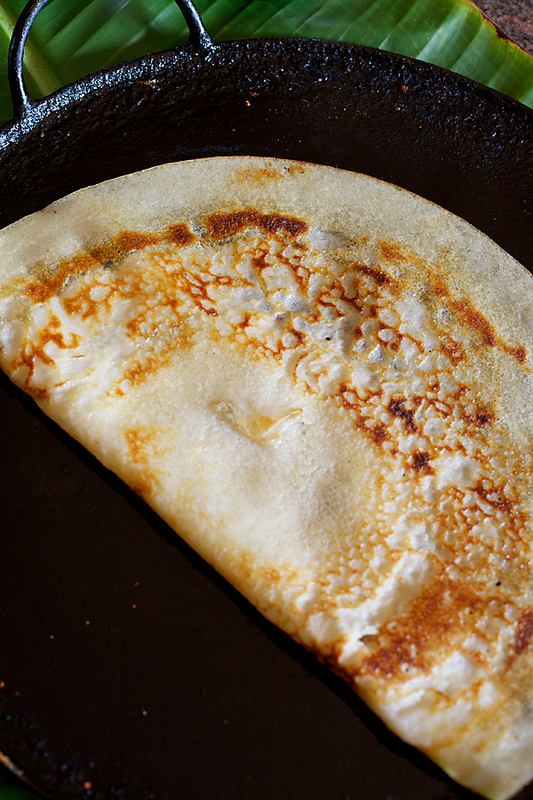 To make it crispy, I spread the dosa as thinly as I can and use a little extra ghee or oil (preferably ghee for that rich aroma) to make it crisp and brown. Ambika: Thanks for the compliments. You will love the sesame coconut chutney for sure! what a splendid photo feature!! Makes me want to dig into amma's crispy yummy dosas, RIGHT NOW. Wow.. nothing can beat mom's food 🙂 the dosa look yum and the clicks are fantastic! i tried your banana bread and it came out very well. I used palm sugar instead of brown sugar and mine got baked at 45 minutes itself. Thaks for the recipe. and tomorrow i will be trying this dosa of your mother and will let you know. Wonderful, mouth watering recipe and pictures! The very first cover picture (of the Griddle and chutneys on the banana leaf) drew me like a magnet to read this post.. Now, I am really craving for dosas, right now! Oh how i miss the benne dosas! lovely of you to give this recipe. will definitely try it. thank you. one hot comment to you. just now had the dosa. it was a welcome change from our usual dosa. only for adai we add all lentils. this dosai had a different taste and I love it a lot. there was a slight hesitation to try the sesame chutney. but i shud only say i was proved wrong. I loved that too. thanks a lot for all these wonderful recipes. and for this dosai, very special thanks to your Amma. 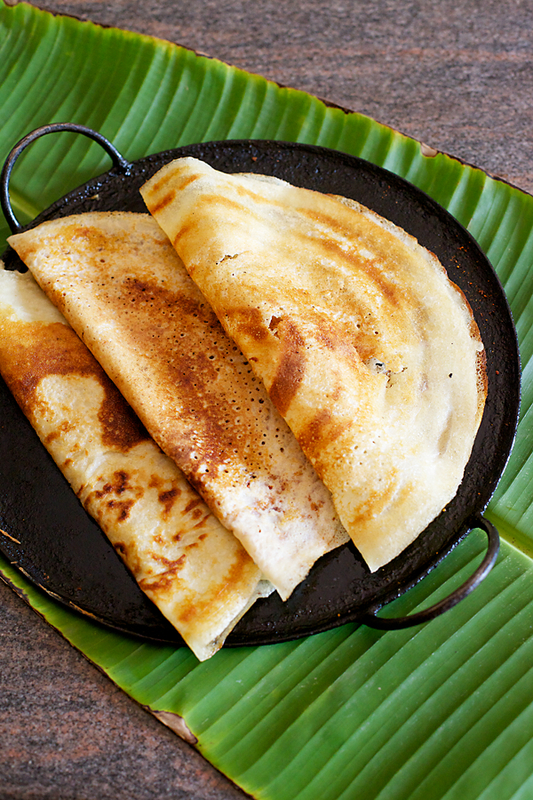 Love dosas, and your mother's recipe sounds exquisite! She looks like a real South Indian lady. What a blessing. Thank you for sharing. Loved the simple lucid explanations, but got to double check on the proportions again…Loved the pic of your mom standing over the kitchen dosa pan. Loved the pan and the green banana leaf…and the black and white pic of your mom!!! Anushruti, thank you so much for this recipe. Learning to make good dosas has always been on my list of things to do and though my mom makes awesome dosas, she can never give me the exact proportions. She is one of those who always cooks by approximation and I am a total cooking novice who can never cook unless I have the exact proportions, so my dosas have always been lame. But now that I have your recipe, I know I am going to get it right coz ur recipes have never,ever failed me. I am so excited, I have planned to make masala dosas this weekend :D. Hope I am able to do justice to your awesome recipe. 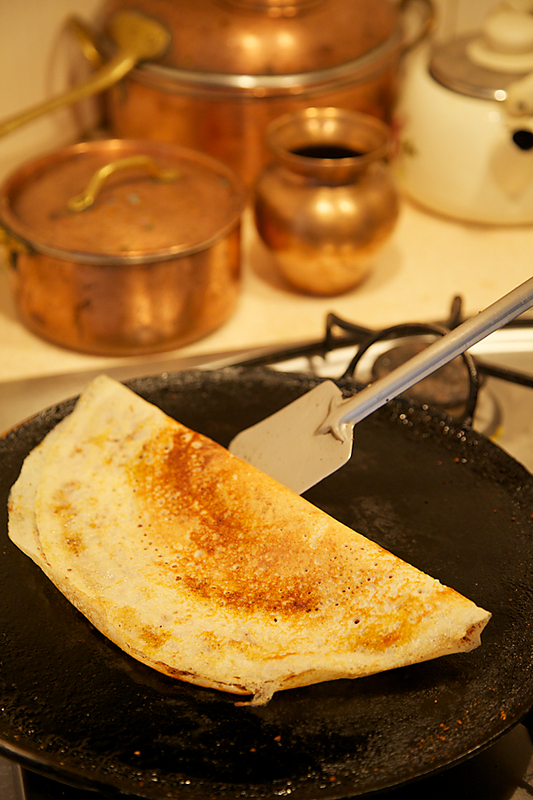 This is my MILs dosa recipe too! I make it pretty often 🙂 Lovely post with a personal touch. Vasumathy: Thanks for your feedback! Glad you enjoyed this dosa with the chutney. The sesame coconut chutney is my favourite too. Shoba: Thanks for all the compliments. Lovely dosas Anu..Pictures are beautiful and aunty is looking beautiful as well. Look forward to eating these dosas! & I HAVE NEVER EVER TASTED DOSAS LIKE THIS EVER BEFORE..EXCELLENT..my hubby just loves dosas n yesterday..thanks to ur recipe..i tried the dosas following exactly your recipe..just halved it..n they were SUPERB..thank u soooooooooooo much..by the way i have also tried the yellow custard cake from ur blog n tht too was v.good..n since i too am a pure vegetarian so keep on trying eggless bakes..
laxmi: great! My mother will be thrilled to hear that! All the best to you! When I read the ingredient list, I thought this dosa sounds like adai. I tried it today and it is very much a dosa recipe and one that I will make often. Your mom's molaga podi looks so good. Do you have a recipe for that? Nivedita: Will try and put it up sometime.. I have tried out so many different combinations for a crispy dosa and yours is the best by far.Thanks to you and your mum I need not search any more for a perfect dosa recipe.I have also tried mnay other recipes from your blog and all have been great.Gratefully yours forever! Poornima: My pleasure! Thanks for letting me know about your success with this recipe. Yesha: Thanks so much for the feedback. Can you please let me know preparation of that orange-red powder sprinkled on top of the dosa. I just recently discovered DivineTaste and have already caught up on every single one of your posts! Seeing fresh ideas that I can use for meals for my family is really all I am looking for, especially meals that don’t take long to prepare. Some would say my favourite food is coconut but I would say it is my favourite cooking ingredient as I love incorporating it in my food, be it fresh coconut, coconut flakes or milk. I loved your mother’s recipe for Dosa with coconut sesame chutney so much that I featured it on one of my recent blog posts at the CouponSpy Blog with some of my other favourites. My name is nagalakshmi ,mother of a grown up daughter I love making traditional indian food ,but we eat all other cuisines open to any new tastes,living in US for so many years we developed to special love for other cuisine to cook and taste.I loved your mother's dosai recipe it's really yummy I prepared it twice it's tasted really divine.We have our traditional methods from both sides mother's and in-laws ,I follow that I keep trying new other varieties with different grains other new tastes.Well I thoroughly enjoyed your mothers dosai recipe,Thanks to u and to ur mother. Nagalakshmi: Great to know that! Hope to hear from you again! Thank u ,for this recipe ,convey my big thanks and warm hug to your mom for this great recipe can't get enough of this dosai.This recipe is like a white canvas were I can change it to make it more healthier by adding brown rice ,oats ,quinoa with rest of the dals and poha .The result is A+,I was surprised it turned out great.Since this is very common for Breakfast or Dinner . Naganaresh: Thanks for your feedback. Will surely convey to my mother. No idea if they have your permission but if not, then that's kind of disgusting. Preeti: Thank you so much for bringing this to my notice. They havent sought my permission. Love your recipes. And your cookware too. Please can you tell me from where you got this amazing dosa pan? Tried your peanut, sesama chutney. Delicious. Jinny- These pans are available in any local markets in South India.